I keep many apps open full-screen to maximize screen real estate on my laptop. If I have some full-screen app open and create a new window, I more often than not want that window to not go fullscreen. 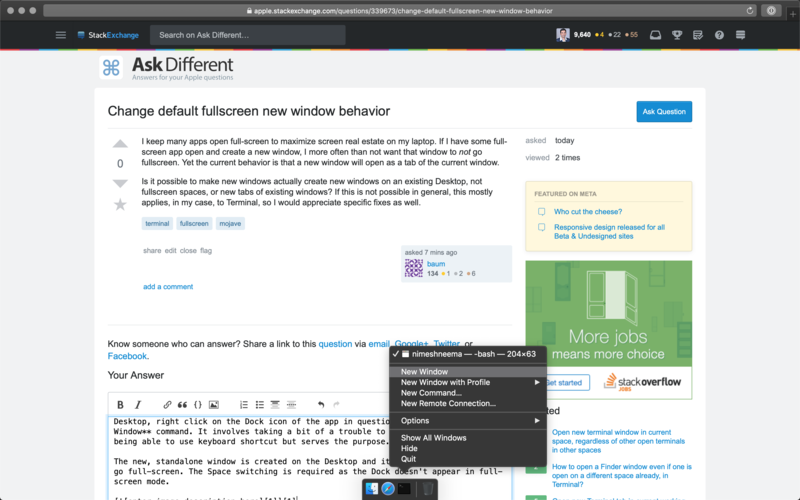 Yet the current behavior is that a new window will open as a tab of the current window. Is it possible to make new windows actually create new windows on an existing Desktop, not fullscreen spaces, or new tabs of existing windows? If this is not possible in general, this mostly applies, in my case, to Terminal, so I would appreciate specific fixes as well. I have a similar use case. The workaround that I follow is to swipe back to any of the Desktop, right click on the Dock icon of the app in question and select New Window command. It involves taking a bit of a trouble to switch Space and not being able to use keyboard shortcut but serves the purpose. 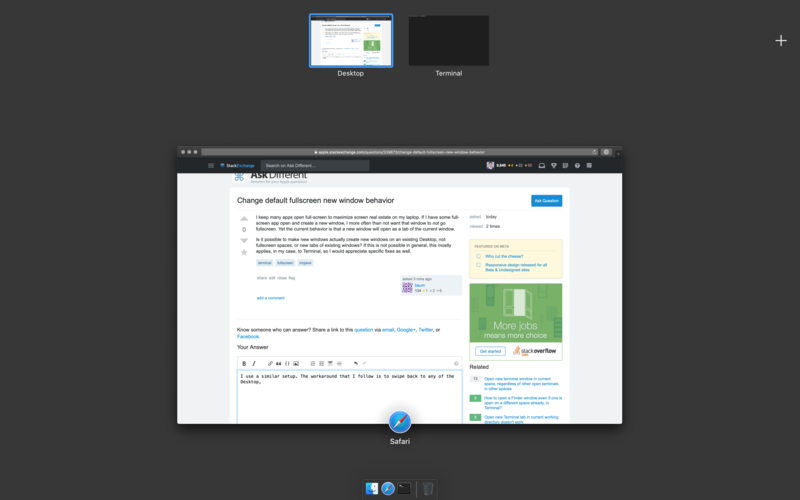 The new, standalone window is created on the Desktop and it doesn't automatically go full-screen. The Space switching is required as the Dock doesn't appear in full-screen mode. Switch to any of the open Desktop. Right click on Dock icon to select New window command. Not the answer you're looking for? Browse other questions tagged macos terminal fullscreen .